What do Charlemagne, the Romanovs, and Templar Knights have in common? Exactly! 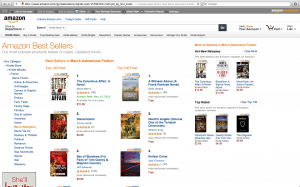 New York Times Bestselling thriller author, Steve Berry. 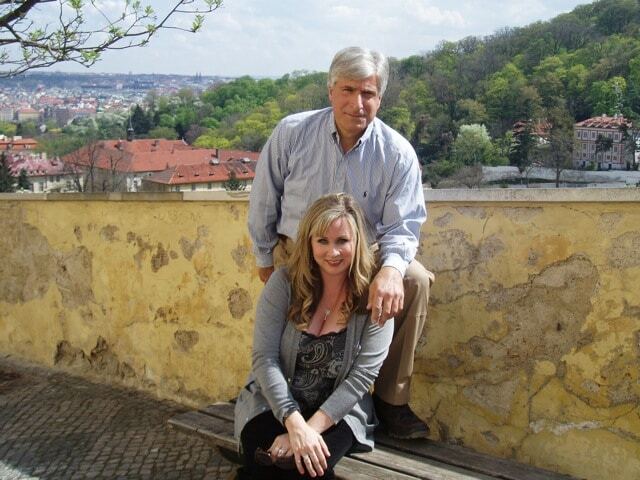 When I first met Steve, we were both practicing lawyers and published authors. He was living in South Georgia, but so close to Florida he might as well have been a Floridian, too. Later, we served on the board of International Thriller Writers, Inc., together when ITW was in its infancy. 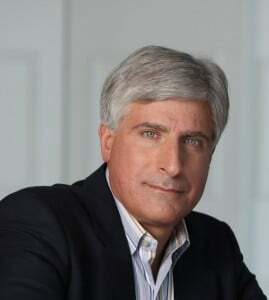 Now, Steve Berry is the author of three original e-books, and ten novels, all of which have become New York Times, USA Today, and Amazon bestsellers with 14 million copies in print, translated into 40 languages and sold in 51 countries. You can find a complete list of Steve’s titles HERE. Steve’s newest is The Columbus Affair, which goes on sale today. I’m thrilled to have with us, my friend, Steve Berry, appearing today at a San Diego event. Diane Capri: Launch Day is always a day of equal parts excitement and exhaustion for all of us. You must be up to your ears in alligators right now. Thank you for taking the time to visit with us on launch day for The Columbus Affair. We’ve talked a lot about great premises for thriller stories over the years. My readers ask me this question all the time, so I’m sure yours want to know: What’s the basic premise for The Columbus Affair and how did this idea first come to you? Steve Berry: The premise behind The Columbus Affair came to me years ago when I found, Sails of Hope, by Simon Wiesenthal, which offered a fascinating new take on Christopher Columbus. We know virtually nothing about Columbus — where he was born, his parents, how he was educated, what he looked like, how he made it to the New World, and what happened once there. All of that is unknown. Then Wiesenthal offered a more startling revelation, one that intrigued me. So I filed the information away and, when I was looking to write this stand alone, the idea became the novel. During the research, I learned about the Jamaican Maroons and knew they had to be included. Then a final book, more recent, Jewish Pirates of the Caribbean, by Ed Kritzler, provided the spark for the last piece of the puzzle. It’s a terrific tale and I hope readers will enjoy it. Diane Capri: Many of your books start out from such a kernel and you’ve got a great podcast on this subject, too, don’t you? Diane Capri: You’re living in St. Augustine, Florida, now, the oldest city in the United States. It’s safe to say Christopher Columbus had a little bit to do with that, too. But does your new home have anything to do with this book? Steve Berry: St. Augustine really doesn’t have anything to do with the book (though another spot in Florida does), but it’s full of wonderful historical sites that may inspire another book some day. You just never know. Steve Berry: That was nine intense days, from dawn until midnight. Operation Thriller. The first time a contingent of fiction writers has been sent into a war zone. We visited troops all day long, then interacted with more in the evenings. Reading was the number one recreational activity over there. Those nine days taught me a great appreciation for what the United States military does. It takes a lot to run a war. 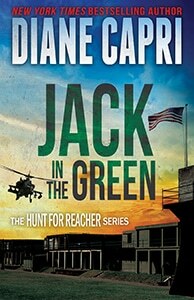 Diane Capri: That sounds frightening and inspiring. Was it? Steve Berry: Not too frightening. But inspiring? Absolutely! Diane Capri: Can you give us the best example? Steve Berry: The injured in the two hospitals we visited were the most inspiring of all. Lying in their beds, several with nearly half of their bodies gone, never once did we hear anything but optimism. Incredible. If given the opportunity again, I’d be the first one to head back. Diane Capri: As you know, I’m a huge fan of your wife, Liz. The two of you have started a foundation called History Matters. Tell us a bit about that. Steve Berry: In all of my books, history is critical. Always, there is something from the past—lost, forgotten—something that continues to hold great relevance today. As Elizabeth and I traveled the world, one comment we kept hearing concerned the dwindling supply of funds available to preserve our heritage. So we launched History Matters to assist communities, around the world, with historic restoration and preservation. Diane Capri: Readers may not know how important this work is. What are the challenges you’re facing? Steve Berry: Here are some startling statistics. Just within the United States there are more than 1.7 billion rare and unique books, periodicals, and scrapbooks in collections, at least 16%, 270,000,000, are endangered because of poor conservation. Of the 21,000,000 paintings, sculptures, and decorative art in those collections, 26%, 5,500,000, are threatened. Of the 4.8 billion artifacts held in public trust by more than 30,000 archives, historical societies, libraries, museums, scientific research collections, and repositories, over 65% report damage due to improper storage, another 53% note a danger from moisture, and 26% have no environmental controls to protect their collections from the effects of temperature and light. Diane Capri: We’ve got a lot to lose if we don’t get this thing under control, don’t we? Diane Capri: Okay, you’re on your way now to the first The Columbus Affair launch day appearances. If readers want to catch you on television or in person over the next couple of weeks, where should they go? Steve Berry: Visit our website, SteveBerry.org, and check out the Events page. It has all the places around the country we’ll be over the next four weeks. Come on out! We’d love to see you and have a chance to talk in person. Diane Capri: Okay, Steve. One final question. I’ve heard rumors that we might need to change your name to Steve Berry: Designing Man, hmmm? Steve Berry: *Laughs* Maybe so! We moved from Georgia to Florida and discovered that Elizabeth is not all that fond of decorating. Then we discovered that I like it. So I’ve spent the past couple of years tinkering around the house, changing this and that, decorating. It’s a great diversion from writing and allows me to clear my head out on something totally unrelated. Does your home need a new look, Diane? I’d love to do something like this for you? Give me a call! Don’t forget to check out Steve’s appearance calendar. He’s serious about wanting to meet more of you. 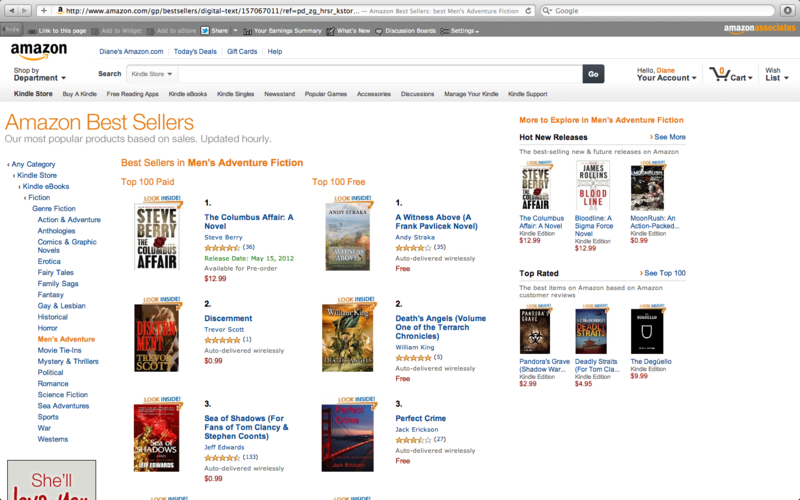 And for all of you who have joined the e-book revolution, The Columbus Affair is already at the top of the charts! Fun interview, Diane! I got to see Mr. Berry speak at RWA last year, and loved his sense of humor. I’m going to check out History Matters! Glad you enjoyed it, Jenn. I’m sure Steve would be thrilled to have your input at History Matters, too! It’s really wonderful to hear about an author who has done something for the troops. My husband did a combat deployment to Iraq (before he was my husband), and those men and women really deserve a chance to take their minds off of their duties even if only for a short time. I totally agree, Marcy. Operation Thriller was a worthwhile experience for everyone involved. 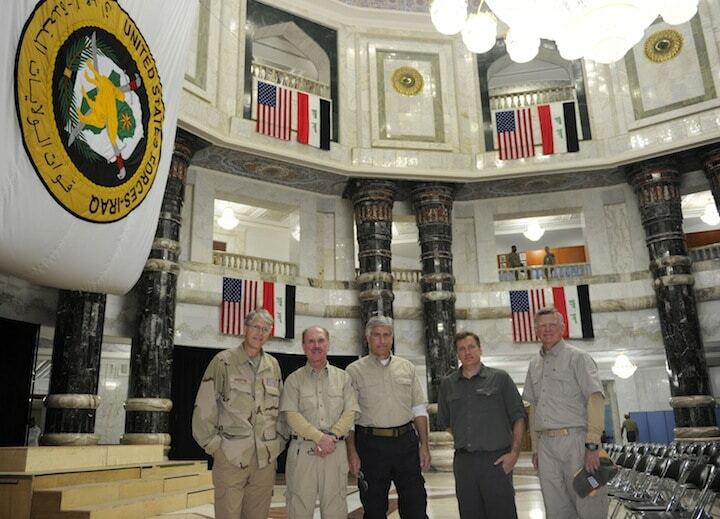 Many authors volunteer to support our troops in other ways as well. If this interests you, I can steer you toward a few accessible ones. You can use books as wallpaper like that? That would be awesome!! Diane, you’re so connected! Great interview. Great Interview! Mr. Berry sounds absolutely wonderful and I am delighted to hear about the History Matters program. We need more people to care like that. “The Columbus Affair” sounds like the perfect fit for my family. I’ll be lookin for that one to add to our library. Thanks for the kind words, Debra. History Matters is a monumental project. They need all the help they can get. And be sure to let Steve know what you think of The Columbus Affair. Every author loves to hear from readers. Wonderful to know that writers are going overseas to meet the troops. fun interview, Diane. Well done. Thanks for reading and for your kind words, Louise. Appreciate it very much. Okay, that room looks heavenly. And Berry’s latest work sounds intriguing. I can already see it turning into a crime series on TV or the big screen… Thanks for introducing me to a new (to me ;)) thriller author! Attracting new readers is a wonderful thing, August. I’m glad we could bring you a new voice to consider. What an awesome interview, Diane. 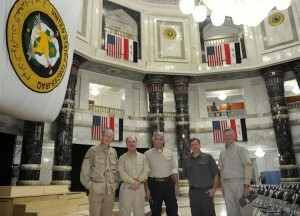 I admire Mr. Berry and the other authors for the tour to visit our troops. 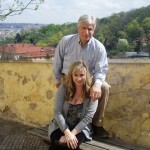 And starting the History Matters site, yay for Steve Berry and his wife Liz. Mr. Berry has quite a knack for interior decorating. Great taste! 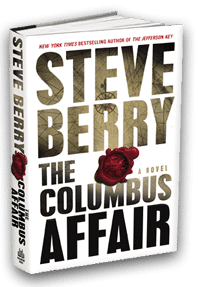 Congratulations to Mr. Berry on the release of The Columbus Affair. Thanks for reading, Lynn and we appreciate the kind words. That library does look lovely, doesn’t it? 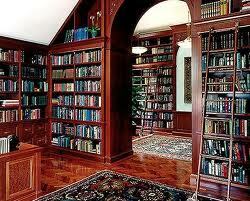 I’d love to have a place like that to curl up with a good book, wouldn’t you? Wonderful interview, Diane. You know the most interesting people. The work Steve and Lis are going with History Matters is so admirable. Congratulations to them for taking the initiative to spearhead the program! Well, thank you, Sheila! 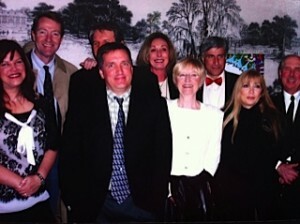 And I agree I know some very interesting people, like you and the other WANAs, for instance! Writers are a great bunch of folks and many of them give back. Steve and Liz are going above and beyond with History Matters. It’s a labor of love for them both — which is always the best kind, right? Thanks for stopping by. Appreciate it very much.